… might sound as a strange advice. When driving to Florence, I took a completely different route over France. The distance between Superchargers on the return route (which is mapped above) was considerably smaller. 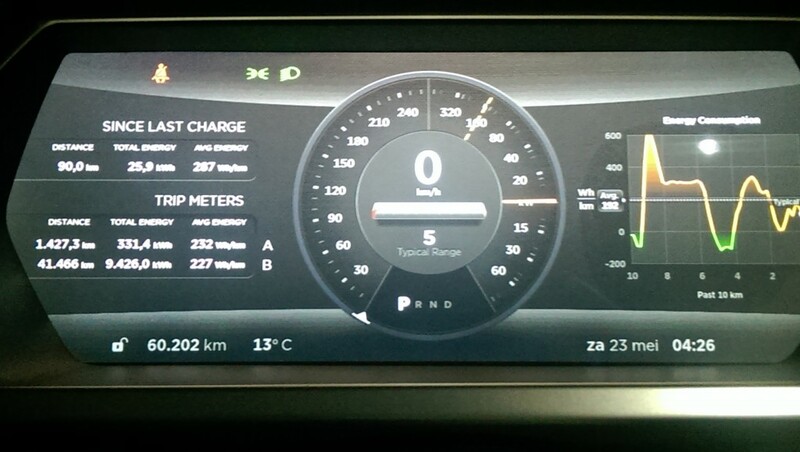 This meant the charging started at 105-110 kW, and dropped to 90kW when reaching 50% SoC (=State of Charge). 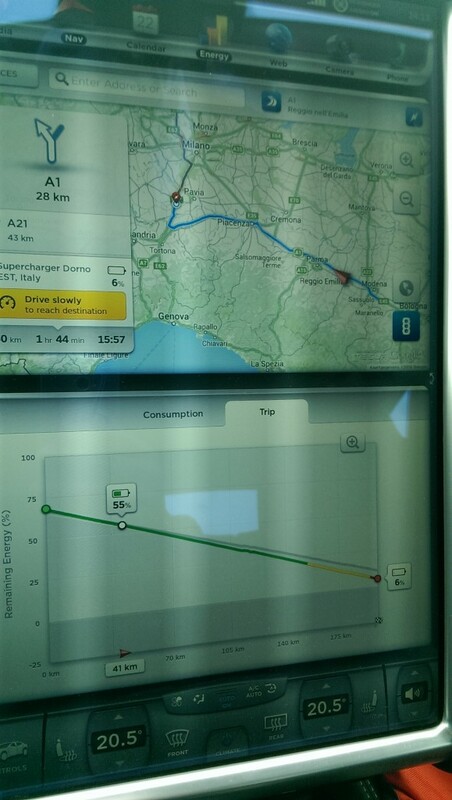 The France route has more distance between Superchargers but less charge stops to make. So I had to charge up to 80-85% SoC. In these SoC’s you can’t charge much faster than 44kW, meaning you get less energy in your battery in the same timeframe. 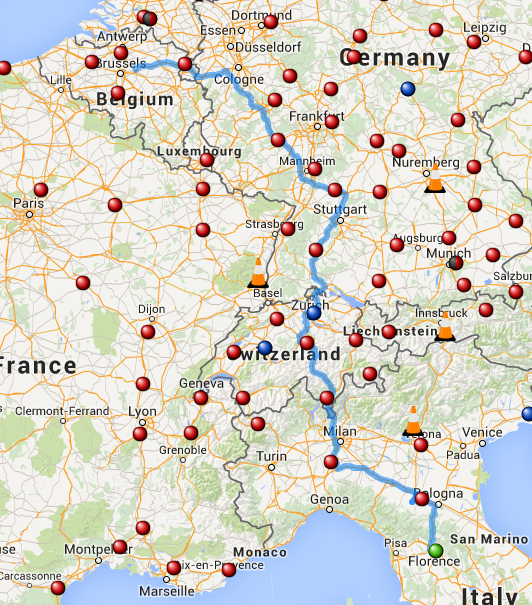 So if you can choose, always pick the route with Superchargers every 100-150km. You’ll stop for a quarter and you’re off again. Superchargers are mostly located very close to the highways, so you don’t lose that much time taking the charge de-tour. And make sure you drive your battery as empty as possible. This allows you to charge your car faster. is a real added value to long distance driving in a Tesla Model S. It still has his flaws, but it’s going in the right direction. When you plan a route, you get this green line, which turn yellow or even red in the end. This line represents the predicted SoC during your planned trip. When starting your trip faster then planned, the line starts moving downwards (because you’ll consume more energy). The accuracy of this planner is really good. The trip planner uses differences in heights as a parameter for planning. When going through tunnels, he thinks you’ll drive over the mountain. This can sometimes add a lot of energy to your prediction (as here in the Gotthard tunnel in Switzerland). But some extra energy is always welcome when doing trips. I’m not a big fan of driving through the night, but for this trip I choose to, because I didn’t want to have delays at Superchargers. When all Superchargers are taken, the charge speed is reduced (the stalls are connected in pairs. 2 stalls are connected to 1 Supercharger. The SuC (Supercharger) distributes the energy between the 2 stalls. The stalls are also numbered 1A,1B,2A,2B,3A,3B,… If there’s a car on 1A, try to avoid stall 1B, because you’ll get less power). Going to Florence took me about the same time, for 200km less. So I didn’t win any time, but I was able to follow German traffic on German Autobahn, which I prefer above constant speed limit changes in France. Long distance driving in an electric vehicle has really changed with those Superchargers along the routes. There’s no more range anxiety and charging stops are much less time consuming than they were a year ago. 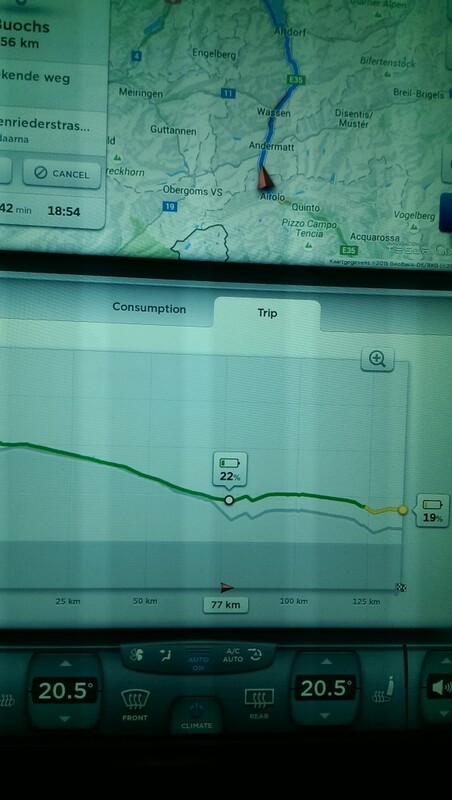 Tesla has made good steps forward in their navigation software, which makes route planning child’s play.